While the result on the postcard is for the Everton game, the main cartoon is an allusion to the Gunners’ next opponents as this cartoon would have appeared in the following week’s edition of the Kentish Independent, on Friday 2nd December. This is a reference to Small Heath (shortly to be renamed Birmingham), who were nicknamed “the Heathens”. 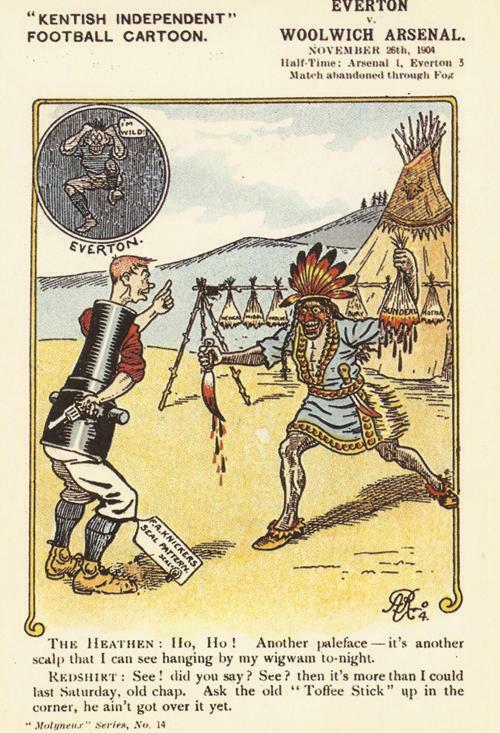 The native American Indian depicts a Heathen and the pre-match discussion is between Redshirt and the native American. Lately, Small Heath were in a purple patch of 8 wins in 10 matches, and had beaten many teams including Sunderland, Newcastle and Bury. They took Woolwich Arsenal’s “scalp” on Saturday 3rd December winning 2-1 and, in the process, moved to second place in the league. The ‘wild’ Everton chap in the left hand circle is an obvious reference to the fact that on Saturday 26th November they were robbed of 2 points as the game was called off so late in the second-half and, according to the match reports, their players and officials were distinctly irate at the referee after he made his decision which meant the game was abandoned after 76 minutes due to fog. Additionally, Arsenal had what was alleged to be a perfectly good goal not given as the referee could not see what the nearby crowd could, namely that Roose, the Everton goalkeeper, scooped the ball out when standing well behind the goal line. 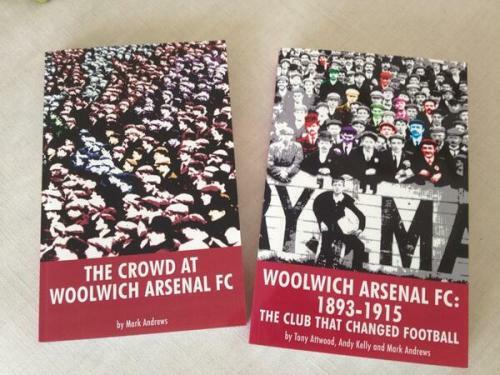 The replayed match on 22nd April 1905 was won by Woolwich Arsenal 2-1 to deprive Everton of the League championship. Newcastle United were champions with 48 points from 34 games whilst Everton were runners-up with 47 points and terribly unlucky not to win the League. The abandoned game against Woolwich Arsenal with Everton leading 3-1 and the subsequent loss in the replayed game five months later was awful bad luck. Particuarly so as all it did for Arsenal was move them up one place in mid table from 11th to 10th position. The two points from the original game would have been sufficient to ensure that Everton were champions. Who would have thought a macabre and, to modern eyes, frankly bizarre cartoon could have such hidden depth of meanings and undercurrent of title changing importance. Are you speaking in your capacity as Arsenal player or Middlesbrough manager?